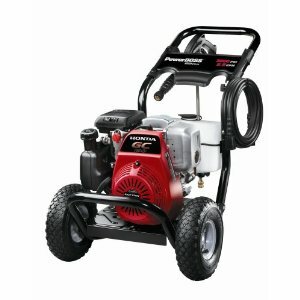 Power Boss is a Briggs and Stratton company so it is odd that they would equip their 3000 psi model power washer with a Honda gas engine. However, since Honda makes an unbelievable engine there should be few complaints. The Power Boss GC190 3000 psi pressure washer is capable of handling both residential and commercial jobs. When combined with a trailer and a water supply tank it would make a very capable commercial unit for a pressure washing company. The unit is equipped with an onboard detergent tank and 4 quick connect spray tips. Accessories can be added to enhance the machines capabilities. The most appealing feature of the Power Boss GC 190 machine is the price. The Honda powered machines start at less than $500 making them within the reach of any new pressure washing company.